Road Trail Run: Review-Saucony Kinvara 7: Same Stats. Major Changes. Review-Saucony Kinvara 7: Same Stats. Major Changes. 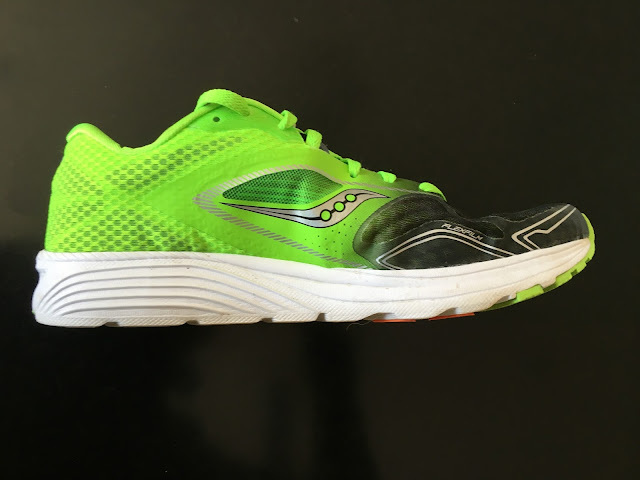 Saucony Kinvara was the first shoe from a major company to incorporate a lower heel toe drop in a light weight trainer racer, a 4mm drop versus the then more conventional 10mm or more drop. The Kinvara continues that heritage with exactly the same stats as the Kinvara 6: 22mm heel/18mm forefoot stack and a weight of 7.7oz/218grams, men's size 9, 6.6 oz/187 grams women's size 8. The midsole geometry is new on the lateral side. Same basic foam but with no deep heel grooves on the lateral side, less of a cutaway at midfoot and shallower forefoot grooves. Replacing the grooves is a concave midsole side wall which deflects more evenly than the grooves and is intended to provide a smoother transition to toe off. The outsole is all new with a Tri-Flex chevron pattern, similar to the Triumph ISO 2, instead of the traditional high pods with outsole rubber. The new outsole sits on top of the shallower midsole grooves and stabilizes the forefoot but it s also a bit stiffer flexing up front. The PWRGRID heel insert is replaced by a TPU based Everun insert, similar material to adidas Boost. The upper is redesigned with a snugger more dialed in fit upfront. "As for the lateral heel of the shoe: Quite a change for us! What we found through the development of EVERUN is also a different way to construct our midsoles (and outsole for that matter) to work in harmony with the new technology. By taking out the traditional ‘deep grooves’ in the heel that you are used to seeing we found that we could achieve more ground contact and smoother transitions from heel/midfoot to forefoot for this runner. One question that always comes up, and what I think you are asking as well is: ‘Wait, so how does the shoe decouple and flex as well! ?’ – The sculpting, and geometric pattern we have used here (and can be found on our other EVERUN shoes) actually helps with the decoupling effect as the runner lands and rolls through their gait cycle. That paired with the ‘concave’ design allows us to maintain the same amount of flex and fluidity with a new visual design (which we hope you think looks pretty sleek!)" So so how do they actually run? Sam: I last ran in the Kinvara 3 leaving it behind for the more stable and responsive adidas Adios Boost for my half racing shoe. I found the older Kinvaras too soft and unstable, particularly upfront with its high midsole pods topped by a bit of rubber. The heel was also soft. Overall ,it was too slipper like for my taste, too "natural". While I did not run in any subsequent Kinvaras, I did carefully examine the 6 at my local running store Runner's Alley and tried them on side by side with the 7 to compare. The Kinvara 7 runs and fits quite differently than its predecessors and is much more is to my preferences for a stable ride and snugger upper. The upper is snugger than the K6 or K3, not as unstructured and slipper like, with more of a performance almost race fit all over. It is not overly constraining for me although I did find adjusting the lacing tightness to be tricky, loose tie is better. This said those with wider, higher instep, higher volume feet may not care for this change. The heel and forefoot rides are far more stable. Very smooth transition, I could really feel continuous ground contact with none of the sinking or collapsing feel I had in the 3. The forefoot while a bit stiffer than the K3 or 6 is particularly well cushioned, more comfortable than the adios Boost and reminding me a lot of the Altra Impulse forefoot, my 2015 Shoe of the Year. Both have a long smooth flex that I like but in the case of the Kinvara 7 there is more drop ,and while just as stable, less of a harsh heel landing. The Kinvara has a lively, light directed ride with enough support for a marathon for me. Peter: I think I’ve run in K1,2, 3 and maybe tried 5. First impression is that I was running in a shoe that had lost touch with the original magic of the Kinvara. K1 was a light and fairly minimal shoe with lots of cushioning and lots of flexibility. While I didn’t mind the K7, it didn’t really feel like a logical next step in the Kinvara series. As previously mentioned the major changes to the midsole from the Kinvara 6 are on the lateral side of the shoe. A less segmented heel is replaced by a concave sculpting to provide more ground contact and a smoother transition. Upfront the midsole flex grooves are shallower, especially as you go towards the middle of the shoe. Again more ground contact and stability with the downside a bit less flexibility. The Everun TPU heel wedge is nicely responsive a great balance of cushion and rebound. Its claimed longevity will also likely be a key factor in stabilizing the rest of the light EVA in the heel area. The diagram below outlines what Everun is all about. Note the Kinvara only has an Everun heel wedge, no Everun top sole as in the Everun Triumph ISO 2. The outsoles of the Kinvara 6 and 7 are significantly different in design and feel. especially in the front of the shoe. 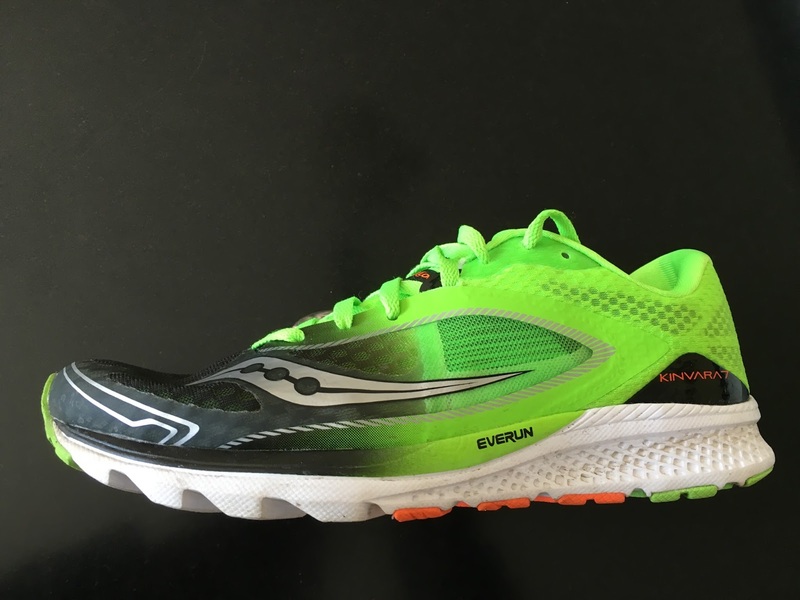 The Kinvara 7 now uses Saucony's Tri-Flex outsole design also seen on the Triumph ISO 2. Note how the orange outsole chevrons on the K7 extend closer to the edge of the medial at the midfoot side than the red patches did in the K8 and the more continuous , less segmented white outsole back of that. All of this we think translates to more ground contact, smoother transition, and more stability but...a bit less flexibility. The front of the shoe has a nice long flex which is very similar to the K6 but it is a bit stiffer particularly at the very front of the shoe. This is not a shoe with the distinct toe spring flex point of say the adidas Adios Boost. The medial side of the midsole remains largely unchanged. Sam: The upper is an area sure to generate controversy. The Kinvara 7 no longer has a slipper like somewhat unstructured upper. 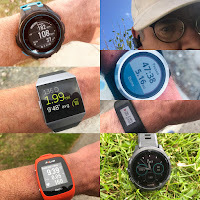 It's not that the materials are heavier it's more that the fit is more dialed in, closer to a race tempo trainer than the previous models light relaxed fit. There is definitely less volume or less room for the foot to move or in my case in the past slip around in the toe box.They fit me true to size, just. Those with higher volume feet may want to size up half a size. The front Flex Film overlays running from the lace area are more central over the top of the foot than the K6. The lateral silver logo overlay extends further forward on the K7 but is a lighter material. 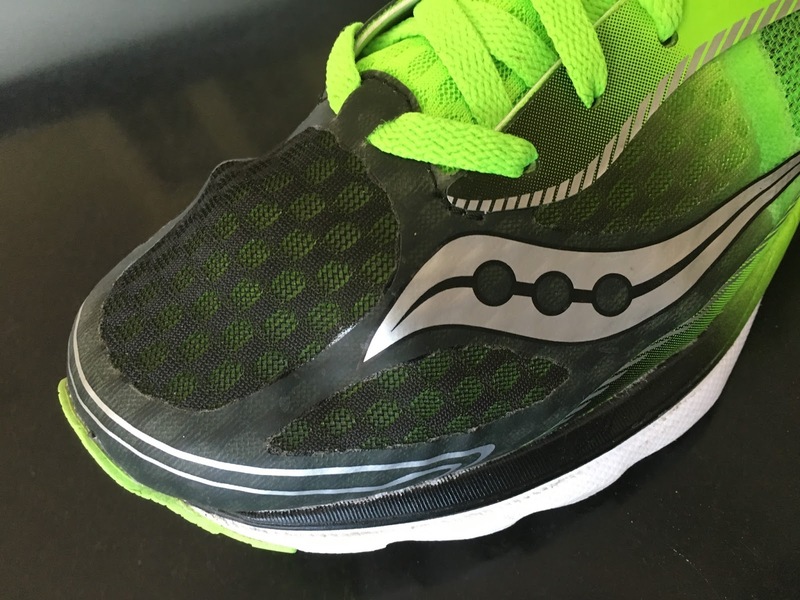 The rear of the heel counter on the Kinvara 7 appears slightly lower than on the Kinvara 6.Note also the shallower rear heel de-couple groove on Kinvara 7. To hold the mid foot to the platform and keep the foot aligned many light weight trainer racers use some form of strap or cord. Nike has their FlyWire, The new Brooks Neuro (review soon) uses a series of cords wrapping all the way around the foot, Skechers has started to use interior bonded straps. The alternative is often a very snug arch for example in the New Balance Zante or substantial overlays, for example adios Boost. Saucony's approach is Pro-Lock. Sam: Pro Lock are straps and substantial ones, if of soft rubbery material. They are about an inch wide at the laces and even wider as they meet the midsole.. They run on either side from lace holes to the midsole towards the rear of the shoe. In a nice aesthetic touch, the black straps have green patterns painted on them so that looking at shoe the primary green color is not overwhelmed through the light outer mesh. They effectively lock the foot to the platform without constraining or interfering with foot motion as they are not bonded to the upper. We particularly appreciate not having a tight upper at the arch. The material is very much like Saucony's ISO Fit straps but here the single strap is between layers of mesh upper instead of outside the upper. It is lightly covered by the tongue gusset. The Pro-Lock strap worked OK for me, although some have complained of it cutting the foot. The tongue itself has a fairly thick strip, we call it the "tongue bridge". across and below the gap between the 2 straps. It appeared somewhat thicker than the K6 version. We do wonder about the purpose of the "tongue bridge". We could feel it if we laced too tight and maybe that is its purpose. Ifound that with the wide laces, snug form fitting upper, and Pro-Lock there was no need to over tighten the K7. When we did, we felt the bridge and also lace pressure at the top of the tongue. Saucony might consider making the tongue a bit thicker, eliminating the bridge or making it a larger more padded surface and make the Pro-Lock strap itself out of two materials: the current wide thick strap down low and a softer more fabric like material close to the lace holes to have a more consistent feeling wrap over the top of the foot. Peter: I have some major issues with the upper. The shoe does indeed seem to be a bit more narrow, and in fact caused my pinky toe to rub against the side of the shoe. First time ever I developed a corn on my toe after a couple of runs in the K7. The Pro-Lock seems like over-engineering to me. I feel like they’re fixing a a problem that doesn’t really exist. Plain old lacing has held my feet in shoes for years, I’m not sure I needed Pro-Lock to help. I’m not a fan of the wealth of material used to house the pro-lock system, and can feel it on the top of my foot. It was also tough for me to really dial in the fit of the shoe, partly because of the pro-lock system. Sam: Kinvara 7 has been an absolutely delightful shoe for me. Well cushioned, stable, and very light. I particularly like the stable heel, smooth transition, and well cushioned if a bit stiff forefoot. The snug close to race flat fit is what I prefer even in a training shoe when I pick up the pace. Peter: I’m not a huge fan of the ride. Let me clarify: I don’t mind the ride, but I don’t love it. This shoe is much closer to something like the Triump ISO to me than the older Kinvaras. Gone is the slipper-like feel and gone is the super flexible ride. Sam: Both these shoes have a long smooth flex,something I like. The heel in the Kinvara 7 with the Everun and new geometry has less of a harsh landing than Impulse with the Impulse forefoot a bit more cushioned and more flexible. Nod to Kinvara as a marathon shoe and for training. Despite additional weight nod to Impulse for 10K racing due to its stability at speed. Impulse review here. Sam:The Lunar Tempo is lighter, more flexible more unstructured, more slipper like. Their cushion is similar but Kinvara is more stable and slightly firmer. Slight nod to Lunar Tempo for long run upper comfort. Nod to Kinvara for dialed in performance feel. Lunar Tempo review here. Peter: The Lunar Tempo is a great of example of where I thought the Kinvara line was headed—light, flexible and tons of cushioning. The K7 on the other hand did a U-turn and headed towards less flexible and a firmer feeling cushion. Kinvara's forefoot won't beat you up as the adios does onlonger runs. adios Boost a bit more agile at speed due to its pronounced snappy toe flex. As the Kinvara also has TPU, same material as adidas Boost, they both have well cushioned yet responsive heels. Adios Boost 1 review here. Sam: No contest for me here. Certainly a fine shoe but in comparison I found the mid foot upper on the Zante tight under the arch, its ride firm and quite harsh from heel to toe. An outsole like the Kinvara 7 on Zante, less continuous rubber, would likely change my opinion. Zante v1 review here. Peter: K7 is a little stiffer and clunkier than the Zante. I don’t feel like the transition is as smooth, and feel like there’s a little more shoe there with the K7 than the Zante. If the Zante is too little shoe for you, the K7 might be perfect. Peter: These two shoes actually run pretty similarly to me. The Skechers fit is much more dialed in though—more room for toes and no pro-lock weirdness. 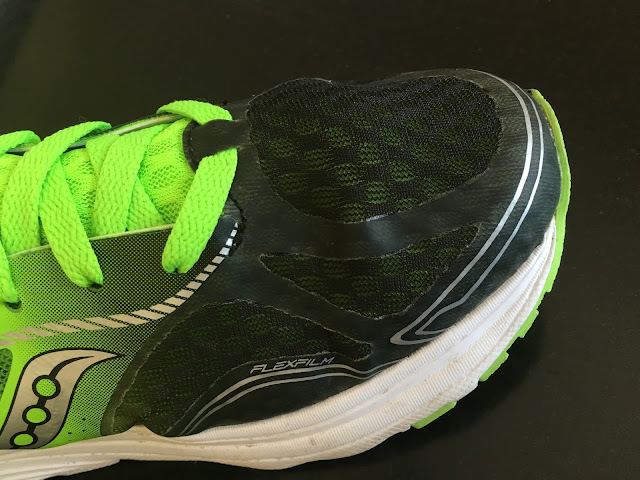 Sam: The Kinvara is softer and more forgiving overall than the Tracer (review) which is a full blown firm racing shoe closer in feel to a New Balance 1600 for example. One could say that the Kinvara 7 is closer to what one expects from a Hoka in terms of cushion than the Tracer. The Tracer's upper is more comfortable in particular over the mid foot. Sam: The Zealot didn't do much for me. In the particular the thick firm outsole rubber made for harsh landings despite the decent cushion. The feel under the mid foot, well supported by the thick outsole rubber was for me not the best kind of light stability. While undoubtedly the Zealot will last more miles than Kinvara 7 clear nod for me to Kinvara 7. Saucony Zealot ISO review here. Sam: These are close cousins in design sharing the Tri-Flex outsole design and an Everun heel wedge. The ISO 2 was my 2015 Trainer of the Year (see here) There are similarities in their stable directed ride. The ISO 2 more substantial outsole rubber will last more miles but at a higher price too, $150 vs.$110. It's upper and ISO Fit strap system should be more comfortable for higher volume wider feet. Quite frankly I get much of the goodness of the ISO 2 at a far lower weight and price in the Kinvara 7. 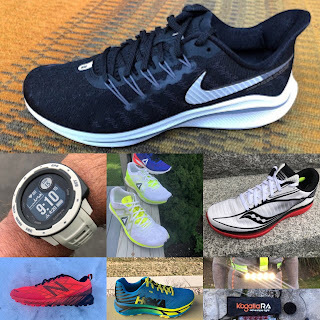 Peter: In the years since the introduction of the OG Kinvara, several other running shoes have been introduced that deliver on, or improve upon, the promise of that shoe. There are several terrific shoes out there that feel like heirs to the original Kinvara. The Skechers Go Run 4, 2016, the New Balance 1400 V3 and the Altra The One 2.5 are all terrific, light, flexible shoes that seem like they may have evolved from the Kinvara DNA. The K7 feels like something else. It’s in a sort of no man’s land between light and flexible and stiff and supportive. The Knvara 7 would be a good shoe for people with narrower feet, who don’t want a truly minimal feeling ride. There’s nothing bad about them (well, except that narrow toe box), but they don’t sing for me. I think they’d be a good fit for someone who wanted a little less shoe than a Transcend or Triumph or Kayano but still wants some protection for the long haul. Sam: I have raced once in the Kinvara 7, and at least for now it becomes my new favorite shoe for halves (generally around 1:38), marathons, and tempos. For me a very fine and one would say brave update to Saucony's stalwart long running act given the changes in midsole geometry, outsole, and upper fit. Less "natural", less slipper like, more stable, all good improvements for me vs. earlier versions and still, and even more so now, a lot of shoe for 7.7 oz. What more could one want? Some tuning of the flex in the forefoot and of the Pro-Lock and tongue area the only things I would ask for. For those seeking a light, well cushioned, decently stable ride the Kinvara 7 is a great choice. -0.10 for a bit of discomfort over the top of the foot, Pro-Lock and tongue bridge. The Saucony Kinvara 7 will be available March 2016. $110. The Kinvara 7 was provided at no charge to Road Trail Run. The opinions herein are entirely the authors. Thanks for great review. Is the sole wider than the 6...looks like a nice wide stable platform compared to Lunartempo and Zante. Hi Anonymous, I tried to measure K7 vs the K3. Both the forefoot and heel of the K7 are narrower where the rubber hits the road than the K3. This said at mid foot which is about the same width there is less sculpting of the lateral side on the K7 which helps with the stability. By eliminating this sculpting and the deep lateral grooves I think this is why the shoe feels more stable to me, if a bit stiffer. I will try to add some pictures of K3 and K7 side by side. Thanks for reading! Please tell your run friends about Road Trail Run. We are also on Facebook here https://www.facebook.com/SamsRunning/ or search on FB for "roadtrailrun.com"
Kinvara 7 is wider than 6.